Personal injury claims, including claims for medical malpractice and wrongful death. 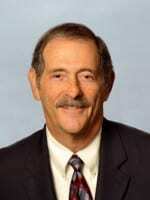 Mr. Corey received his undergraduate degree from the University of Colorado 1963 and graduated from Georgetown University Law Center in 1966 with a J.D. degree. Mr. Corey served as law clerk to the Hon. James A. Walsh, United States District Court Judge for the District of Arizona after his graduation from law school. Mr. Corey is admitted to practice before all state and federal courts in Arizona, the 9th Circuit Court of Appeals and the United States Supreme Court; he has served as President of the Pima County Bar Association, and Committee Chair for the Public Relations Committee of the State Bar of Arizona. He has been listed in Who’s Who in America, Who’s Who in American Law and Who’s Who in the West. He has played an active role in Tucson non-profit organizations, has served as Board chair or director of United Way of Greater Tucson, Tucson’s Information and Referral Service and Tucson’s Community Food Bank. Since 1984, Mr. Corey has maintained an AV® rating by the Martindale-Hubbell peer review system.